The original podcast of the track above can be found by clicking here. It is the last one on the page. Brett Warren of The Warren Brothers talks about his past struggles with drugs and alcohol. Whether you are a parent or a teen, you should make the simple switch … from reading to clicking on the podcast above. I’m seeing a scary parallel in the global society with what is found in Isaiah 47. What do you think? This becomes important for our lives when we realize that any of us could be heavily engaged in any of these. The obvious solution would be to become merciful, humble, righteous, and trust in the divine. To fail to do so, yields destruction (47:15). Ultimately, your direction is left up to you (47:15). What is your choice? Will you not make the simple switch? Will you not yield to salvation? This woman perceives this generation to hold much hate and is therefore wanting the generation to change for the better. 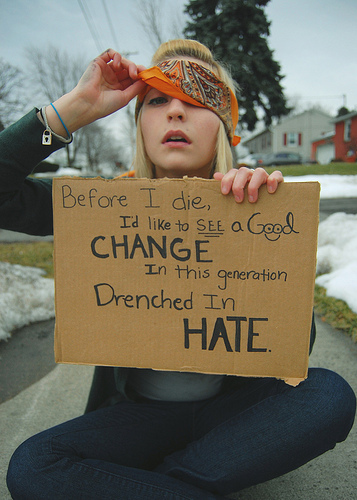 This woman perceives that the only good change that can happen is one that is drenched in hate.